Paintings since the Renaissance in Europe are based on realism. After the 19th century, a movement against the traditional realism happened. But they transformed or abstracted it based on realistic sketches. On the other hand, among Japanese artists, there were those who designed concrete paintings that do not base on realism by designing symbols of a shape like idol of a moral religion like animism or totemism . Jiro Oyamada created an artistic character, such as a comic character, and had a painter who gave the background a suitable background for the character. Jiro Oyamada is one of them. Jiro Oyamada was born in 1914 and received academic art education at Imperial Art School. He encountered surrealism there. But immediately after that World War II began, in an environment where it became a scorched earth, he continued painting in isolation. The person he draws is such a strange character as not to be seen by humans. His painting space, which is made with the character as the center, brings the viewer to reality realness goes to a different space. We can distinguish his work at a glance by looking at the image of the work. Not a few of his paintings have prominent personality. A strange creature staring at here from the dark. Or a world of fantasies emerging in fresh colors. The world he draws attracts those who see glimpses of humor and kindness at times, even in surprising force. Oyamada experienced World War II during his most auspicious period in his twenties. When he experienced the extreme wartime experience, he saw the human figure that he could not normally see. 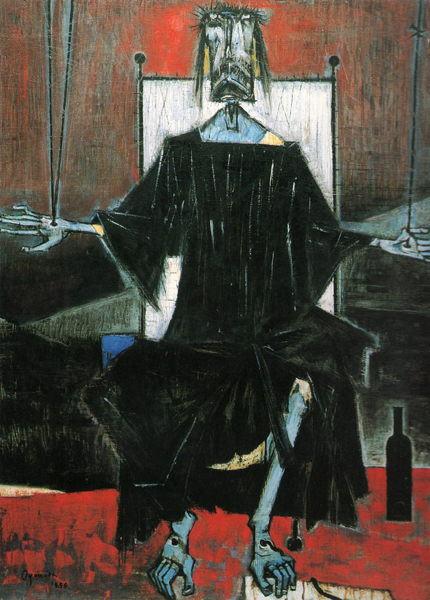 And in the 1950s he became the age of his late thirties, he chewed up the intense experience under wartime and sublimed it in painting expression. Many people appreciate his works of this time as such. He borrowed a style of traditional Christian religious paintings. Perhaps he needed the universality of that style. There is his painting "Pieta".Pieta is Italian, meaning mercy. The religious painting Pieta is a kind of image of the Virgin and Child. Drawing in Pieta is the figure of the Virgin Mary holding the crucifixion of Christ, crucified and taken down from the cross. Many painters and sculptors are making works based on Pieta as a motif. For example, the sculpture of St. Peter's Basilica, produced by Michelangelo, is famous. There, Christ seems to feel dignity even though it is a dead body. And Virgin Mary is a grieving mother who lost her beloved child with a pure appearance, and at the same time her mercy and compassion are transmitted. 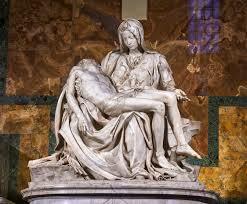 The sculpture by Michelangelo and "Pieta" painted by Oyamada have the same pose and positional relationship between Christ and Mary. Therefore, Oyamada follows the style of Pieta. However, in Michelangelo's sculpture, it is composed of rounded curves as a whole, the circle is warmth, the viewer imagines mercy and charity. On the other hand, Oyamada's paintings are composed of straight lines, giving a viewer of the angular gistogism impression as a whole. As this "Pieta" has a strong sense of tension, the viewer of this painting feels a tragic elevation and astonishment. Let's actually look at Oyamada's "Pieta". The Virgin Mary located in the center is an isosceles triangle. Christ lying parallel to the base of this isosceles triangle, that is, horizontally. The composition of these two people is a combination of a triangle and a straight line. She not only has a triangle outline, it is composed of a combination of triangles. Her mouth and nose are vertically aligned in an equilateral triangle. This means that her mouth and nose are facing upwards. She is lifting the lower jaw. It is facing upward, that is, looking up at the heavens. It is elevation. However, her eyes are represented by what the downward triangles lie side by side. Although she is facing the face to the sky, her eyes are turned downward. Here is the confrontation relation. And the outline of her face is a downward triangle. Also, as I said at first, her posture is an upward facing isosceles triangle. Here her face and direction of the body are opposite, a conflict relationship is born. She has a hierarchy of alternating triangles like nesting. In other words, she has a multilayered structure in which upper and lower binomial conflicts are layered. What is creating this confrontation is an angular shape composed of straight lines called triangles. This makes the binomial confrontation more sharp. Furthermore, in coloring, being confined to monochrome by the opposite two colors white and black, it is fueling the confrontational relationship. The geometric screen made up of triangles is static and massive as a whole, but the tense feeling up to the stinging things with confrontation is stretched among them. Here again, let's focus on her face. Her face is multi-layered conflict. When we see her face, I recognize a strong tension. Specifically, it is a strong emotion that protrudes and those conflicting or confusion. From the strong tension with conflict, expression of emotion such as intermediate calmness or compassion can not be born. It is possible to interpret such a figure of Virgin Mary as a figure caught in despair such as grief, fear, anger, despair, curse against the threat of my child Christ being deadly dead It is. She is drawn in black and is depicted as a spooky person who can not be distinguished from men and women. On the other hand, let's move attention to the lying Christ. The appearance of this Christ seems to be a dry mummy, and it is free from sanctity and sorrow. Also, the head of Christ is drawn as a skeleton. The body is warped, legs and hands are rigid. The Virgin Mary holds the Christ which began rigid after death. It is not in a state that can hope for revival very much. For example, as a figure that received an abuse of crucifixion of Christ 's corpse, the acts blurred religious sufferings that totally carries on human suffering and original sin and so on, Holbein' s He is not doing drawing dead bodies with real true figures like" The Body of the Dead Christ in the Tomb ". I thought about the reason for that. He could not draw the dead body of Christ calmly like Holbein. Compared to him, Holbein seems to be an objective observer. In other words, Holbein keeps a distance to what Christ has encountered. That's because Holbein is not a party. As mentioned at the beginning, Oyamada experiences an extreme situation under wartime. At that time, he should have been a bystander. Therefore, he was unable to be a bystander in the extreme situation that he became an indelible figure of Christ. If he was among the people throwing stones in Christ, would he be able to capture the imageof Christ calmly? He also felt lied about fearlessly that the Virgin Mary of "Pieta" embraced the Christ of unrepentant appearance, with a mercy expression. For him, humans are sublime, but there are places like animals at the same time. Even if Christ and the Virgin Mary carry the sins of mankind, or that they have given compassion to mankind, they are also human beings. So they should also have aspects that are animal. He should be told to disgustingly in the wartime that in extreme circumstances human animal aspects will emerge. So, in the situation of "Pieta", if the Virgin Mary and Christ are love or religious, it means that they are not human beings. That same applies to Oyamada himself who draws "Pieta". So, he could not draw in realism. When we look at "Pieta" as a whole, we will talk about an unpleasant atmosphere or impressions of strange power. As mentioned above, it is said that Oyamada carefully designed the screen composition and drew "Pieta". Its contents are as described above. Let's see "Harituke (crucifixion)".He drew this as a subject of the crucifixion of Christ. Some say that he painted himself. The cruciform shadow behind it looks like a wall rather than a pillar of a tree. The upper body of a man naked is drawn so as to stick to the wall. The man has a thick chest and a large upper body is drawn. If we look at this depiction, I think he is carrying a robust physical body. In his whole body numerous large and small holes, scratches, black marks like blood marks are drawn. Moreover, while the chest and abdomen are drawn largely, the head is drawn extremely small. If we look at him, our gaze will focus on the body, not the face. When we see ordinary figures, we focus on the face of the person being drawn. However, in Oyamada's "Harituke(crucifixion)" the face is small enough to make the expression unknown and our gaze gathers towards the body. So, we leave a strong impression on myriad scars and bloodstains drawn on his body. However, Oyamada does not directly depict the miserable form in which he was abused. As a reference, I would like you to see the part of "Isenheim Altarpiece" of the German painter Grünewald during the Renaissance from the Middle Ages. 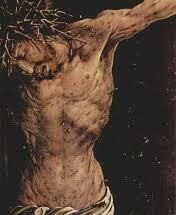 Grünewart declares the cruelty of the crucifixion of Christ, that it is a matter of wanting to cover his eyes. 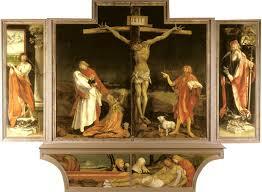 When we see this altarpiece, we can imagine that the Christian faith of the time when this was drawn was sharp. Christ drawn by Oyamada Jiro is not outrageous miserable compared with the drawing by Grüne Barthe and skillfully creates an atmosphere to emphasize the image symbolically. For example, in the dark screen based on black, the body of the crucified person is blue is the same color as the Christ of "Pieta". Therefore, we speculate that this painting is connected to "Pieta". In other words, it implies that this painting is part of a series that delves into the essential aspects of human beings, being religious subjects. On the other hand, he paints the body of Christ as a keynote with the subject matter of crucified and cruelty Christ in this painting. He shows the dead body 's black transparent with color in spite of the unbelievable thought that the dead body is rotting and dark. For that reason he blended the blue exquisitely into a bluish appearance and set the sharpness of the black and darkness of the cross behind. Besides, in order to make use of this exquisite color, he took the composition as geometrically designed. In addition to that, he does not cause mechanical coldness by partly destroying its geometric composition. On the other hand, he pays close attention to keep a sense of tension. That is why when we see this painting, we allow you to see the screen without turning your eyes for a long time. Let's look at the "Mukashi no Seijya(Old Saint)". A man with limbs like a bird is sitting on a chair. He has a nail inserted in both hands and is fixed to the ceiling with a string, both feet are also fixed to the floor. It is like the appearance of Christ crucified. However, his cheeks can be handled, beards are all-you-can-grow, shin and toes are thin and bent like birds. Contrary to the work title of the saint, he can not feel dignity nor dullness of love. There is a liquor bottle behind him, he is a poor and oppressed man rather than a saint. Moreover, it gives to those who see the comical impression. Oyamada has this screen composed of a rectangle. Red is impressively added in the dark color arrangement of black and blue. 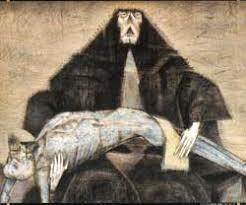 Unlike the dark serious "Pieta" and "Harituke (crucifixion)", the impression of "Mukashi no Seijya(Old Saint)" as a comical impression is that red is inserted in the screen. In addition, the symmetry equilibrium is inevitably collapsed in the screen composition by geometric figures. Therefore, the feeling of tension in the screen composition is diminished. This is one reason why this picture is producing a comical impression. We get a comical impression because we are not immersed in this painting and are looking calmly. 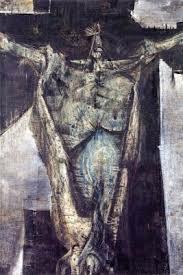 In other words, we do not feel direct force like "Harituke (crucifixion)" in this painting, but inspiration is inspired. What I will mention below is my subjective image, not an objective fact about Jiro Oyamada and it is not generally recognized about him. I think that he is not a painter blessed with natural talent. He was carrying a handicap of the body, so he had no choice but to choose his profession within a limited range. For him, the painter is the result of having no other choice.